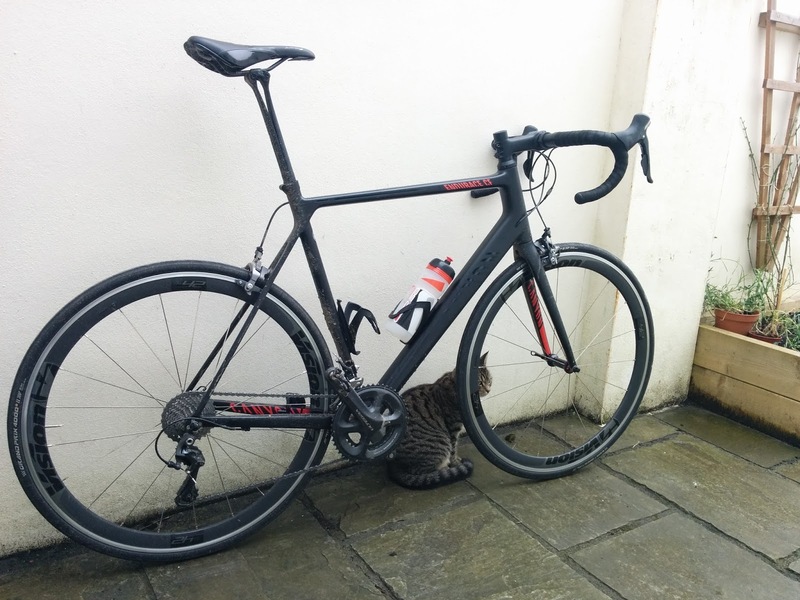 I've had my Canyon Endurace CF for almost 2 years now and it had been absolutely faultless. A couple of weeks ago it suddenly developed a pretty dramatic shifting problem on the rear derailleur where it wouldn't go into the two highest or two lowest gears. It came fitted with the Shimano Ultegra 6800 rear derailleur which is still on there now. I had been out on a long and wet ride the day before so I thought it would just be some crud got into somewhere but after giving it a good clean the problem didn't get any better. It would change between the middle few gears completely fine, it was almost as if both the limit screws had been turned in. Very strange. After playing around with the cable tension for a bit I realised that wasn't solving the problem. To get into the largest sprocket I had to dial in so much cable tension that it would not shift into the smallest sprocket. So I undid the cable and the derailleur dropped into the smallest sprocket as expected, and I could push it across to the largest sprocket without any issues. So the derailleur and limit screws were all fine. I then noticed some fluff or something wrapped around the cable where it entered the outer casing on the chain stay. 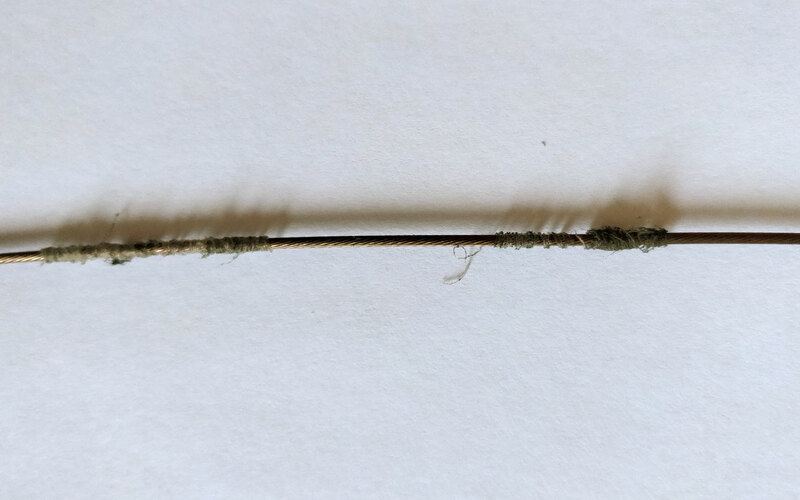 When I went to remove the fluff it was firmly wrapped around the inner cable and I could move it up and down the cable. 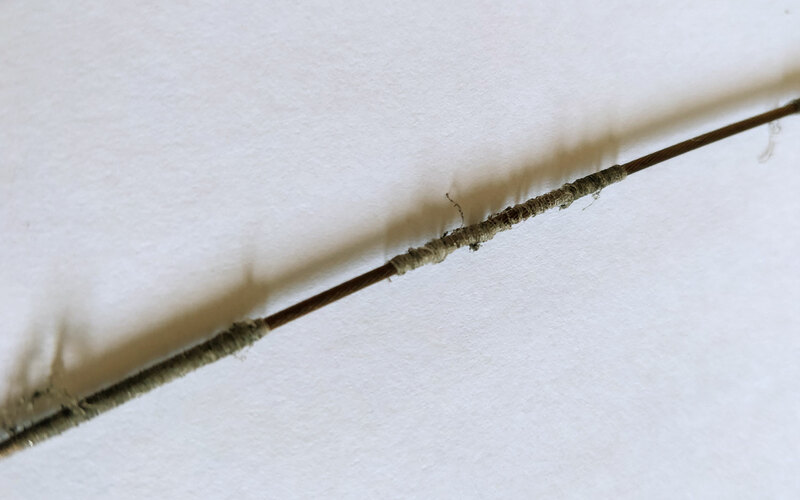 I could then see that it was part of the inner cable coating which had split, then unravelled and started to bunch up. When I removed the section of inner cable this is what I found. The coating (I believe this is the new polymer coating?) had started to unravel in several places and where it had bunched up at either end it was preventing the cable from moving beyond a certain point in either direction. Causing the shifting problems I had experienced. I thought this was worth posting to see if anyone else had experienced the same problem, I could not find anything about it online but I can't be the only one. It's worth noting that up until the shifting went I noticed no detriment in shifting performance from the rear derailleur at all. 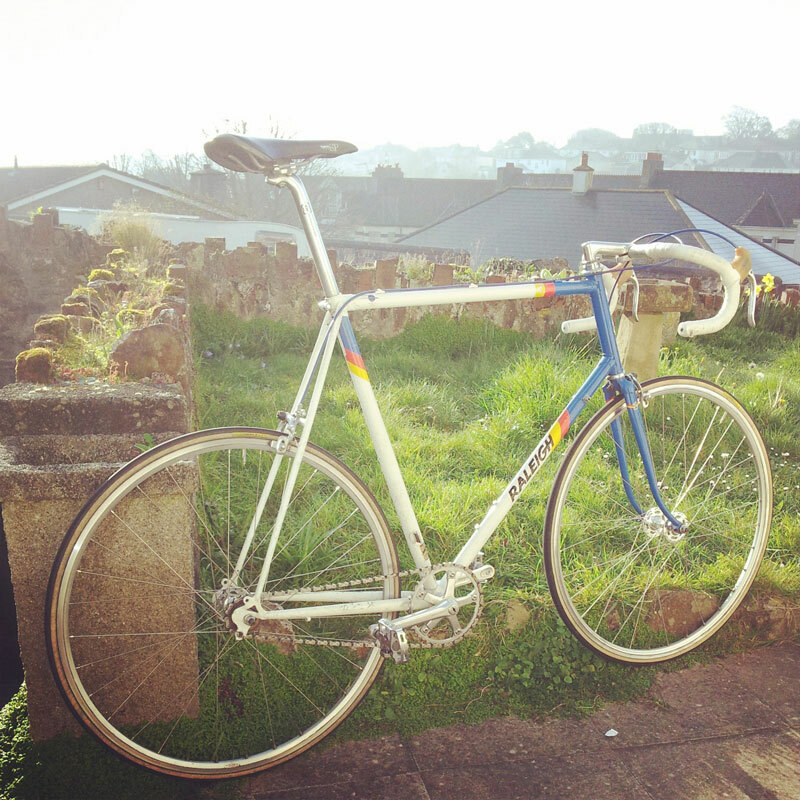 Love your vintage road bike with single pivot side pull brakes but don't love the scary braking performance? Before you ditch the calipers for a modern dual pivot design, follow our easy tips for improving the stopping power, you may be surprised at the results. Many vintage bikes from the 1980's are used as cheap runarounds and basic servicing is often neglected. Replacing a grimy dried out set of 10 year old cables with a fresh new set will work wonders and ensure the power you are putting in at the levers makes its way to the calipers is not lost along the way. To do this job properly will require removing the caliper from the bike, taking it apart and thoroughly cleaning before re-greasing the re-assembling. This will ensure they move as freely as possible and the maximum amount of power is applied to the brake pads. Do not underestimate how much difference a good set of brake pads can make. My first road bike was a Raleigh , it came with the original Weinmann single pivot side pull brakes and some worn out pads which needed replacing. I first bought some generic non-branded brake blocks and the braking was still pretty terrible - in the wet it was dangerous. Unfortunately, due to the long reach and small distance between the brake caliper and front fork / seat stays, it is unlikely that you will be able to fit a modern brake pad carrier. This will make your options for replacement brake pads pretty limited - however all you need is Kool Stop Continental's in the Salmon compound. The Kool Stop Salmon compound is an extremely well regarded aggressive compound for excellent braking in the wet and dry. I bought them after reading many positive reviews online and since fitting these the braking performance of my old Weinmann brakes has been completely transformed, especially in the wet. The braking feels more progressive as well as out and out stopping power. Before fitting the Kool Stops I was sure the Weinmann calipers would need to be replaced, however for me the bike now feels safe and this is no longer required. 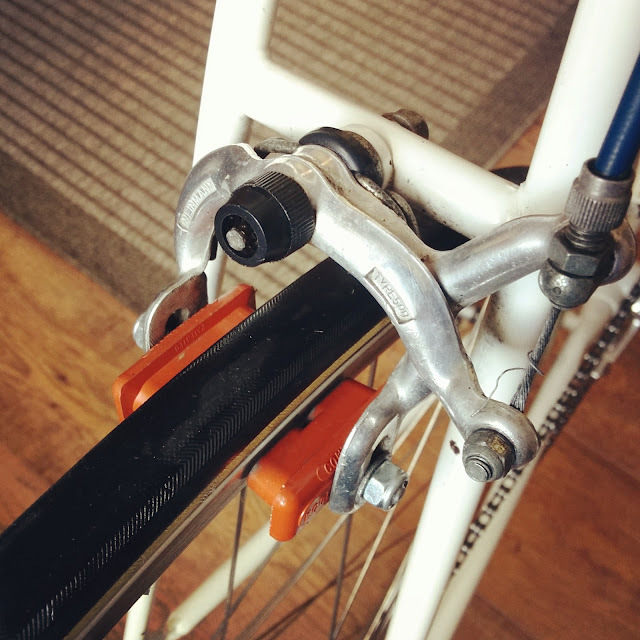 Remember, the pro's used to descend The Alps at race speed using this style of brake set up, so they should be able to provide a reasonable level of stopping power. If none of the above options work then your best option would would be to upgrade the calipers to a modern dual-pivot design. However, fitting modern calipers to a retro bike frame can come with its own complications. Also the non-aero brake lever design does not give any where near as much mechanical leverage when operated from the hoods, so upgrading to the newer aero design will also allow you to put more power through the levers. Having problems with your old brakes? Or had a good experience of the Kool Stop Continentals? Please leave your comments below. SIS Go Electrolyte Powder Causing Headaches After Long Rides? After consistently getting headaches after long rides (more than 3 hrs in the saddle) I think I have finally found the cause - SIS Science In Sport Go Electrolyte powder. Read on to find out how and if it could affect you. A bit of back story - I have been riding for approximately 4 years. 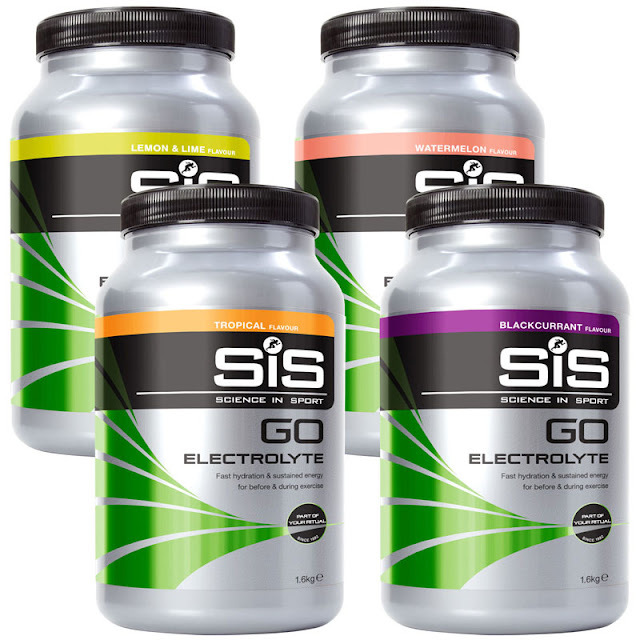 SIS Go Electrolyte was one of the first nutritional products I bought after first reading about the importance of carbohydrates and electrolytes in avoiding the dreaded bonk. I first bought a tub of the Lemon/Lime flavour, it seemed to taste alright, didn't cause any stomach problems and did the job so I never had a reason to buy anything different or think it was causing any problems. I always used it on any rides I knew would be long, carefully following the recommended amounts for adding to water. In a pattern many of you will recognise, the miles crept up as the cycling bug took hold. The 15 mile weekend ride became 25 miles, then 35 miles, then 50 miles. Being generally terrible at pacing myself - sometimes I avoided the bonk, other times I was not so lucky. But one thing was fairly consistent if my ride was over 40 miles - a pounding headache lasting up to 5 hrs after finishing a ride. I would generally be OK sitting on the sofa, but getting up and walking up the stairs (or anything which got the blood pumping a bit) would result in a quite sharp headache which sometimes went away after a couple of hours but on other occasions would last well into the evening. It must be dehydration, I thought, even though I am always very careful to drink well before, during and after a ride. So on my next ride I made doubly sure to drink even more than usual - no difference. Also, without going into too much detail, my pee was clear so I knew dehydration could be written off. Over the next few months I tried everything, too much sugar before a ride, not enough sugar during a ride, too much sugar after a ride etc etc. But none of it made any difference. I thought it must be the cold weather, or just a result of exerting myself for long periods of time. The thing I couldn't figure out was that I never got headaches on shorter rides, even if they were ridden at a much harder intensity or even partially dehydrated. One day I ran out of Science In Sport Go just before a 45 mile ride, not good but i'll survive. So instead I threw some orange juice in my bidon with some water and got on with it. The ride went pretty much as normal except afterwards I had no headache! At first I thought it was just a coincidence - I didn't use to get headaches after every ride, probably 75% of the time. After a ditching the electrolyte powder for a few more long rides, I can report I have not had a headache since. It had never clicked that I only ever used to use Science In Sport Go when I was doing rides of over about 40 miles - and these were the only rides I was getting headaches after. After a bit of searching on Google I found I was not alone and a few other people had started topics complaining of similar issues. I don't know specifically what it is in the electrolyte powder which causes headaches for me, and I have not had a chance to try out any other brands to see if it makes a difference. Clearly it is not an issue which affects everyone as hundreds of thousands of people happily use Science In Sport's electrolyte products, but if you are suffering from headaches after long rides/runs and use an electrolyte/carbohydrate drink then it is worth cutting it out to see if it makes a difference. If anyone has had any similar experience with headaches after using these artificial electrolyte/carbohydrate/energy drinks then please leave a comment below, we'd love to hear from you. Copyright Velo Corner. Powered by Blogger.